Christopher Machut, Chief Technology Officer, Netarus, LLC. In front, wireless armored dome HoistCam HC180 model on top of rugged transport case. Four years ago, Chris Machut went for a walk in downtown Norfolk. But instead of facing straight ahead, looking down at the sidewalk or staring into his phone, he tilted his head back and gazed straight up. What he saw was a tower crane, rising high above the spot that would become the Slover Library. And it gave him an idea. 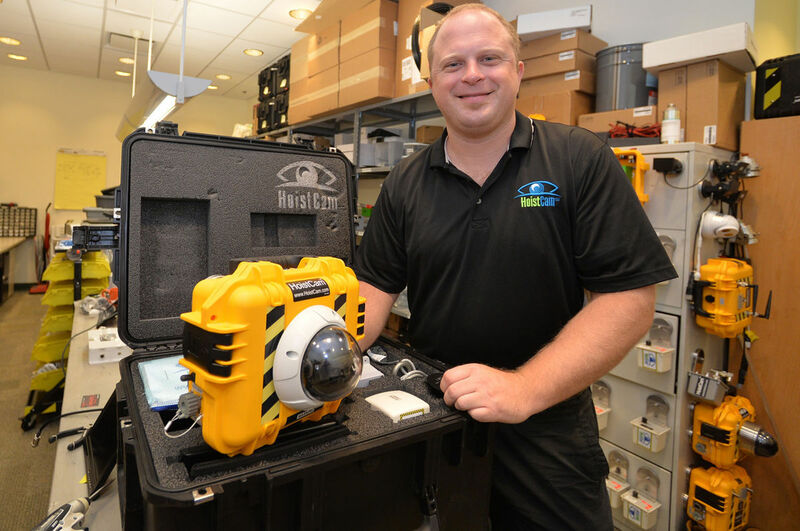 As chief technology officer at Netarus, he has built a business around expanding lines of sight for the maritime and construction industries. Over the last three years, his Norfolk-based company has sold more than $800,000 worth of custom-made camera systems designed to improve safety and efficiency for heavy equipment operators. Netarus creates “situational awareness platforms.” Simply put, they attach high-tech, cloud-connected cameras to construction equipment. The company’s HoistCam gives crane operators a new way of seeing their work, and the enhanced views allow them to work faster, safer and more confidently. But along the way, he discovered completely understanding the big picture requires you to do more than just open your eyes. The evolution of Netarus started with the simple belief a sea captain should be able to see where his ship is going. Along with a partner, Machut launched TugCam, a business that specialized in creating camera systems for tugboats. Machut understood they had the concept and the know-how, but they needed a place. They needed a local business network and access to a long list of partners who could push them forward. In 2012, on the recommendation of friend and mentor Marty Kaszubowski (now executive director of the Center for Enterprise Innovation at ODU), Machut applied to Hatch. The then-fledgling small business accelerator accepted TugCam into its inaugural group of five companies. TugCam got a home office in downtown Norfolk and, more importantly, access to the right people. By many definitions, HoistCam is a success. It provides a simple solution for a niche industry. Machut and his company design and build each camera unit in-house and positive word-of-mouth is generated from a growing client base. But as appealing as the road ahead appeared, it became clear there was a better way. Cameras, no matter how fancy, are a commodity and Netarus has already attracted copycat competitors. In an industry ruled by hard hats and heavy lifting, Machut quickly learned knowledge is king. Cameras kick-started his career, but Machut has since accepted data is his destiny. The shift started last summer when an analytics company paid Netarus a visit. Their conversation inspired a change in direction. The pivot led to a pitch that earned them a $250,000 investment last April. The Launch Place, a Danville-based startup supporter, saw potential in Netarus’ HoistCam Director Platform. The platform gives clients the ability to monitor and record HoistCam activity from anywhere in the world. It also allows for the integration and monitoring of third party equipment such as unmanned aerial vehicles. It’s a full-service video analytics suite that includes complete job site analysis from BIM model integration to logistics tracking. Things are moving fast and slow for Netarus. Machut said the company has two primary goals: get more cameras in the field and figure out the fastest, most useful ways to analyze the job site data. Machut said there have been some incredible examples of how acting quickly on incoming information could have saved money. The company recently received a $45,000 Commonwealth Research Commercialization Fund award from the state and the Center for Innovative Technology. The grant money will be used to help develop the data analytics side of the business. The ultimate goal is to have all of their cameras and collection methods shooting data into the cloud and analyzing it as it’s being captured. The next step is putting together a software development team. Machut has set goals for closing the time delay between data collection and analysis. By March 2017, the target is 30 minutes. By the end of 2017, he hopes to be able to deliver actionable data analysis and renderings on site in under two minutes.